The unveiling of a portrait of Jarnail Singh Bhindranwale in the Golden Temple museum by the SGPC will do nothing but harm to Punjab and the Sikhs. Bhindranwale had become a symbol of secession in terrorism-hit Punjab and the policy of hatred that he followed had played havoc with the State and its people. National Security Advisory Board Chairman M.K. Rasgotra has chosen to revive an important factor in the debate on India’s energy security – the possibility of access to Central Asian oil reserves through China. He has proposed that a pipeline could run from Central Asia to India, via China, instead of via Iran or Afghanistan, which will have to ultimately pass through Pakistan. Chief Justice of India Justice K.G. Balakrishnan has squarely blamed the executive for showing a “step-motherly treatment” to the judiciary. Addressing a Law Day function in New Delhi, he said that because of the executive’s non-cooperation, three crore cases are pending in the courts. West Bengal’s decline under the Left can be said to have reached its nadir on the day when a burqa-clad Taslima Nasreen was surreptitiously hustled off to another “exile” from a Kolkata torn by violence. That her first destination was Jaipur in BJP — rule Rajasthan — she later moved to Rajasthan House in New Delhi and then to a secret “safe house” — added a touch of irony to the Left’s sad record. Here was a “progressive”, supposedly minority-friendly government packing off a brave, liberal-minded Muslim writer to a state under a party whose “communalism” has been equated by the CPM with US ‘imperialism”. The past is a foreign country: they do things differently there.” These opening lines from LP Hartley’s novel The Go-Between echoed in my mind as I watched Om Shanti Om. Down memory lane I went back to my childhood, to the time when as a seven-year-old I’d seen Karz, OSO’s primary source of inspiration. IT was a hush-hush affair when the class teacher of my elder sister sent a small note to our parents that she should start wearing a “half sari”, a piece of non-stitched cloth tucked at the waist that covers the chest and the back. Post-haste my father bought a pair of half saris ending the family embarrassment. She did not have to wear the half sari for long as she soon graduated to the full sari. The Indian media has had the longest ever honeymoon with a Prime Minister to date. No, not even Rajiv Gandhi, who liked mediamen, had this long a dalliance. Agreed that the media in the giddy eighties saw young Rajiv as the bright beacon, dragging a kicking, screaming, lethargic nation into the new millennium. But then “the gun” happened. Remember the ‘B’ word? With President Pervez Musharraf deciding to lift the emergency on December 16, after the conclusion of the elections, his PML (Q) is most likely to emerge as a major political force. It will have no serious challenger in Punjab as Mr Nawaz Sharif’s PML (N) along with the other 32 constituents of the All Parties Democratic Movement (APDM) will boycott the polls. The unveiling of a portrait of Jarnail Singh Bhindranwale in the Golden Temple museum by the SGPC will do nothing but harm to Punjab and the Sikhs. Bhindranwale had become a symbol of secession in terrorism-hit Punjab and the policy of hatred that he followed had played havoc with the State and its people. The violence let loose by his fundamentalist followers set Punjab back by several decades and the poison of communalism that they spewed is still to be fully neutralised. By succumbing to pressure from radical Sikh organisations, the SGPC has disappointed most of the Sikhs who despised the virus of fundamentalism as much as moderate people from all other communities did. To make matters worse, the SGPC has even gone to the extent of branding Bhindranwale as the “greatest Sikh warrior of the 20th century”. All this may please organisations like the Khalsa Action Committee but lowers the pedestal on which the SGPC wants to place itself. But more than the Shiromani Gurdwara Parbandhak Committee, it is the Punjab Government which is to blame. The Parkash Singh Badal-led government enjoys tremendous clout over the SGPC, to the extent that there are many who think that there is a very thin dividing line between the SGPC and the Akali Dal (Badal). It was his responsibility to impress upon the SGPC that the unveiling of the portrait would convey the impression that he and his party have not learnt the lesson that appeasement of the militant sentiment can lead to unwanted consequences. But that was not to be. Instead, it has been a thoughtless move, certainly not in the interest of Punjab which is just coming on a track of economic reconstruction the state badly needs. The state government also courted controversy by providing security guards and allowing red lights atop the vehicles of SGPC members. And now has come the unveiling of the Bhindarewala portrait. By eulogising a man who has the blood of many innocent persons on his hands, it has done sheer disservice to numerous great Sikh personalities. The way the date of the portrait unveiling was advanced is proof enough that it was fully aware of its mischief potential. A sordid past is sought to be revived again under pressure. National Security Advisory Board Chairman M.K. Rasgotra has chosen to revive an important factor in the debate on India’s energy security – the possibility of access to Central Asian oil reserves through China. He has proposed that a pipeline could run from Central Asia to India, via China, instead of via Iran or Afghanistan, which will have to ultimately pass through Pakistan. Estimates as to the oil and gas reserves in the Central Asian region vary, and while they may not match West Asia’s reserves, there is no doubt that they are huge. They form a major reservoir of untapped energy for the 21st century. The quality of the reserves is said to be excellent, which will more than offset any difficulties in access, processing and transportation. The Caspian region, with Azerbaizan, Kazhakstan and Turkmenistan, is particularly rich. Central Asia is widely understood to be the region where the next “Great Game” of the world’s top powers is being played out, not just by the bordering Russia and China, but by the United States. India, given uncertainty and even hostility emanating from its neighbours on the one hand, and its huge energy needs on the other, cannot afford to remain aloof and just watch from the stands. Strategic considerations will determine China’s actions, as its long-standing friendship with Pakistan. The pipeline must clearly be positioned as an economic deal with benefits accruing to all partners. While the same approach applies to Pakistan as well, China may be better positioned to deliver on any such deal. As recent events indicate, Pakistan’s worrying instability and the problems it is having on its Western borders would make it difficult for it to honour and secure such arrangements with India. Whether China will agree to the idea Mr Rasgotra has thrown up, remains to be seen. The Left indulges itself in blind anti-Americanism vis-à-vis the nuclear deal, and there is still doubt if it will allow it to go through. But there is no doubt that cooperation with China on energy will pose even greater challenges than the imagined difficulties with America from non-Left sources. But interdependent deals in international politics are stabilising factors that can even help improve relations in the long run. This is one idea that should be explored fully. Chief Justice of India Justice K.G. Balakrishnan has squarely blamed the executive for showing a “step-motherly treatment” to the judiciary. Addressing a Law Day function in New Delhi, he said that because of the executive’s non-cooperation, three crore cases are pending in the courts. The CJI may have a point in blaming the executive, but Union Law Minister H.R. Bhardwaj says that no file regarding the appointment of judges is pending with him, implying that the Supreme Court collegium has been slow in recommending judges for the courts. Unfortunately, because of this continuing blame game between the two important pillars of the Constitution, millions of litigants are suffering, waiting for justice. It would only be fair if, in the interest of the people, the executive and the judiciary sink their differences and help expedite justice. Both have to pay adequate attention to the administration of justice. Problems of manpower shortage, infrastructural constraints and procedural delays can best be resolved through effective cooperation between the two. At present, the dice is heavily loaded against the judiciary. It has neither any control over funds nor powers to create additional courts, appoint court staff and augment the infrastructure required. It is the executive which controls the finances and calls the shots. The judge-population ratio in India is grossly inadequate — 10.5:13 a million people as against 50 judges a million people in many countries As a result, the judges are unable to cope with the enormous arrears and new inflow of cases. To ease pressure on the subordinate courts, the recruitment of subordinate judicial officers should be shifted from the state public service commissions to the respective high courts as one of the many reforms.aThe judiciary’s demand for financial autonomy merits consideration. The problem could be resolved partially if budgetary demands made by the high courts, which are equipped with “bare necessities”, are accepted without hesitation and allocation made by way of planned expenditure. It is said that whenever the judiciary sends a proposal to the government, IAS officers routinely dispose of the files with a curt noting, “financially not feasible” or “not agreed”. The bureaucracy has to change its attitude towards the judiciary. The judges and the lawyers too should understand their responsibility towards the litigants and act by eliminating procedural delays like diminishing the number of adjournments which they resort to on slightest of pretexts. West Bengal’s decline under the Left can be said to have reached its nadir on the day when a burqa-clad Taslima Nasreen was surreptitiously hustled off to another “exile” from a Kolkata torn by violence. That her first destination was Jaipur in BJP — rule Rajasthan — she later moved to Rajasthan House in New Delhi and then to a secret “safe house” — added a touch of irony to the Left’s sad record. Here was a “progressive”, supposedly minority-friendly government packing off a brave, liberal-minded Muslim writer to a state under a party whose “communalism” has been equated by the CPM with US ‘imperialism”. And now Narendra Modi has sprinkled salt on the CPM’s secular wounds by offering to accommodate the Bangladeshi writer. That this panicky response on the part of the Left took place because a little-known outfit — the so-called All India Minority Forum — wanted a cancellation of Taslima Nasreen’s visa only underlined the Buddhadev Bhattacharjee government’s pusillanimity. There was no chest-thumping bragging by it this time about paying its opponents back in their own coin, as the chief minister said when armed CPM cadres “invaded” Nandi-gram. Yet, unlike those who ran amok in Nandigram, their comrades in Kolkata quietly slunk away when the minority forum activists took to the streets and attacked several CPM party offices, apart from setting public vehicles and private cars on fire. The lion that roared in Nandigram had turned into a mouse in Kolkata. Few will be surprised, however, by this transformation because it is known that bullies are also cowards. But there is more to this predictable change than the behaviour pattern of petty rowdies. Right from the start, the Left’s record in West Bengal has been one of dissimulation and irresponsibility with only a thin covering of ideological pretensions. It is hardly surprising, therefore, that when it really came to the question of standing up for its much proclaimed “secular” credentials, it badly failed the test, with Left Front chairman, Biman Bose, losing little time on the day of the disturbances to say that if Taslima Nasreen’s stay in the city was provocative, then she should leave. It was typical of disingenuous people like Bose to try to change his statement later, but the subsequent conduct of the state government has shown that he was voicing the ruling party’s true sentiments considering the government’s deafening silence on her requests to return to Kolkata. One of the notable features of the Left has long been its penchant for violence, both in and out of power. The recourse to violence was earlier looked upon by the communists as a way of preparing their cadres for their ultimate aim of an armed revolution. But while the final objective remained illusory, the routine skirmishes with the police, and also between the Left parties themselves and with the Naxalites, meant that the lumpenisation of the cadres proceeded rapidly. The people of West Bengal have been aware of this degeneration for most of the last three decades when the Left Front has been in power while the rest of India became aware only after Nandigram. But a major debilitating fallout of the prominence of the storm troopers within the Left parties was that principles became the first casualty. The entire edifice of the Left Front’s rule is built on three pillars. First is the front’s unity, which ensures that the Left votes are not divided, as in 1972 when the Congress won for the last time because of its alliance with the CPI. The second is the disarray in the opposition ranks after 1977 and the absence of a credible leader, which persists to this day. But the third, and perhaps the most important, is the role of the Leftist activists, many of them anti-socials, in browbeating their opponents into submission, mainly in the countryside. As in Nandigram, they carried out murderous assaults on their political opponents in Chhoto Angaria, Keshpur and elsewhere, portraying these in the long familiar terms of a battle between the haves and have-nots. This ideological subterfuge was the reason why there wasn’t a squeak during those incidents from the Left-leaning intellectuals who have only now recognised the true face of the CPM. Although the lumpenisation of the Left Front ensured that it could maintain its tight grip on power - with the police ignoring any complaints of hooliganism and worse by the cadres - what the erosion in the calibre of people in the ruling parties meant was that the state’s proud cultural heritage was undermined. Kolkata lost its cosmopolitanism and its university, academic institutions and colleges like Presidency College their earlier sterling reputation. In the rural areas, this process of decline was accelerated by the withdrawal of the teaching of English in the primary stages, with the result that the younger generations were virtually cut off from the world outside West Bengal. Even their seniors are seemingly at a disadvantage when interacting with the rest of India because of their lack of fluency in English, which is a cause of embarrassment to pravasi Bengalis who live outside the state. If the Left Front was blind to these signs of decay, it was because its long stint in power had bloated its collective ego to monstrous proportions. It was this sense of self-importance which was hurt when the opposition succeeded in entrenching itself in Nandigram. But the reason why its ego wasn’t large enough to stand up in favour of Taslima Nasreen was that the Left’s lumpenisation had eroded its sense of right and wrong. A party which endorses a murderous assault on villagers just because they do not subscribe to the Leftist ideology obviously lives in a moral vacuum. It is not easy to switch from being the supporters of arsonists and rapists to a position of high principles where a writer’s freedom of expression is concerned. A political Mafiosi cannot be expected to abide by ethical norms. Nor was the Left’s deportation of Taslima Nasreen due to a sudden loss of nerve. The comrades had been uneasy about her decision to make Kolkata her second home right from the start, but had been unable to express their reservations in public since she enjoyed the support of virtually the entire intellectual community in the state and in the rest of India. Since the Left has pretences about its own intellectual calibre, it could hardly afford to swim against the tide. Even then, it chose to ban Dwikhandito (Cut in half) in which she made her usual points about the plight of Muslim women. It was left to the high court to lift the ban, suggesting that this august institution, which has been criticised recently by the Left because of its castigation of the police firing in Nandigram on March 14, is more “progressive” than the self-appointed champions of liberalism. Just as Nandigram revealed the CPM’s lack of respect for constitutional norms, the Taslima Nasreen episode has confirmed that when the Marxists equate communalism with US imperialism, they mean only the Hindu version since the comrades are obviously ready to kowtow to Muslim communalism. The Left may not be too concerned about its attacks on constitutional entities such as the judiciary, the office of the governor, etc affecting its prestige. It probably believes that such displays of irascibility boosts its “revolutionary” image. But bowing and scraping before Muslim communalism are another matter. Being as impressionable as any other kid of my age, I had been fascinated by the punar-janam theme. It wasn’t at all difficult for me to believe that the dead Raj Kiran had returned as Rishi Kapoor to avenge his own murder. I wasn’t then aware of bombastic words like “divine retribution”, “reincarnation” and “transmigration”, yet what I saw happening on the screen seemed logical and right. Moreover, I imagined myself being reborn as a film star even more good-looking than Rishi! A lot of water had flowed under the bridge since that age of innocence (and ignorance). Having tasted the bittersweet fruit of the “Tree of Knowledge” over the years, I witnessed the resurrection of Shah Rukh Khan with skeptical amusement. It was all pretentious hokum to me, a grandiose joke at best. How could I not compare the two movies? I observed that Karz had a quality which OSO sorely lacked — simplicity. Subhash Ghai’s smash hit had stuck to the basics — gripping story (though it was borrowed from Hollywood), catchy songs and music, unaffected performances. Even after repeated viewings, I’d found it enjoyable, though not as enthralling as the first time. In contrast, Farah Khan’s “tribute to Bollywood” was an overblown entertainer, too smart and stylish for its own good. The latter’s popularity clearly showed that “nothing succeeds like excess” in today’s crassly commercial world. I felt nostalgic not only for a bygone era (of cinema, particularly) but also for my own childhood, a wonderful period when I had gullibly lapped up everything seen on the screen. I could have really loved OSO as a seven-year-old, but for a 30-plus man it was just mildly diverting, unlikely to be fondly recalled three decades hence. Today, virtually no girl in Kerala wears a half sari which even a sari aficionado may mistake for a dhavani, a kind of scarf. Even the sari, which has been the favourite dress of women, has been facing a threat as more and more women are finding it cumbersome to wear, wash and maintain. Already, the pavada (skirt) and blouse, which was the traditional dress of a schoolgirl until at least she attained puberty, is out of vogue. The dress that girls and women commonly wear in Kerala is the salwar-kameez. It is a different thing that most Malayalis consider churidar and salwar as synonymous. Even this writer needed to be educated about the difference between the tight-fitting trouser called churidar and the loose pajama-like trouser called salwar. 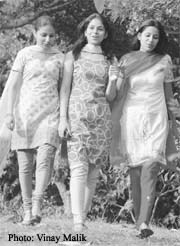 Compared to the salwar, the churidar is not popular with the women in Kerala, where, because of humidity, any tight-fitting dress is extremely uncomfortable. Women find the salwar-kameez, also called a “suit”, very convenient to wear. They wear a sari only on formal occasions in the belief that it is more elegant. Whatever be the popularity of what is called the Punjabi dress, the temple authorities in Kerala have been frowning upon it. One of the most famous temples in Kerala is Sri Krishna temple at Guruvayur. Until July last, women were not allowed inside the temple if they wore salwar-kameez. Those who perchance went there in such a dress could either leave the temple precincts immediately or “hire” a sari to have darshan. The temple committee took a historic decision that month to allow women wearing the churidar to worship the Lord. This upset the dovecote of traditionalists, who claimed that a devaprasnam – an astrological exercise purportedly to know the Lord’s mind – found that the presiding deity was not happy with the decision. Since this did not affect the management’s decision, they went to the Kerala High Court, which dismissed the petition. Not satisfied, they went to the Supreme Court, which early this week upheld the High Court decision. Thus the churidar has finally got legitimacy in the temple where entry to playback singer Yesudas, a Christian, was denied, though he has sung some of the most enchanting songs about the Lord of Guruvayur. The same cannot be said about Sri Padmanabha Swami temple in Thiruvananthapuram where a woman in a churidar still has to wrap a sari around her to enter the temple. Nothing surprising as the temple in the capital considers its dress code so sacrosanct that it once did not allow then President Zail Singh to enter the temple because he, a blue-blooded Sikh, was not prepared to remove his shirt and turban. The rigid rules of the temple will still not allow men wearing churidar, a favourite dress of first Prime Minister Jawaharlal Nehru. Pants and shirt, forget a three-piece suit, are also forbidden in the temple. Men must wear a mundu (white dhoti) to have access to the temple. The shirt is a strict no-no. In the Supreme Court, Manoj V. George, counsel for a devotee, argued against the churidar as it would hurt the sentiments of a section of the worshippers. Chief Justice K.G. Balakrishnan, who heard the case, hit the nail on the head when he said, “The dress code has to change with the time and with change in practices. It is valid as long as it is not violative of the public standards of morality”. Dress has always been evolving. For all the references to saris in religious and literary texts like the Mahabharata and the Silappadhikaram and the historicity of the nine-metre cloth that is worn in as many ways as the individual’s imagination allows, the sari was not a popular dress among many sections of the people in Kerala. The working class always had a disdain for it. The traditional dress of a Malayali woman consisted of a dhoti worn around the waist and a loincloth to cover the chest. In fact, women had to struggle to get the right to wear blouses. When they wore it first in public at Chengannur in central Travancore in early 20th century, the goons among the traditionalists mercilessly beat them up. Even during my childhood, the norm for old women was not to cover their chest. In those days women were expected to take a dip in the pond attached to the temple before having darshan. That wet clothes only expose the contours of the body was shown by Raj Kapoor when he shot Mandakini in his sensuous film Ram Teri Ganga Maili. Today few women take the dip because the stagnant water in the temple pond is considered dirty. Most temples in the south have ponds attached to them. When they were built, huge boulders had to be lifted up for construction of gopurams. In the absence of lifts, what was done was to drag the boulders up over a mound of earth and sand. Thus ponds were automatically created beside temples. Gods have never frowned upon women for breaking such traditions. Man has been worshipping the supernatural for as long as he has been afraid of the future, i.e., since the stone age. Surely the woman those days could not have been expected to wear sari, which dates back to the Indus Valley Civilization. Similarly, the dhoti has been giving way to pants. Many Malayali youth, particularly born and brought up outside Kerala, do not know how to wear a dhoti. To insist that they too should wear it while entering the temple is to discourage piety. All those who go to worship wear clean, if not their best, dress. Nobody in his senses goes untidy to such places. As a matter of fact, Lord Krishna could not have been touchy about the dress because as the legend goes he was fond of taking away the clothes of his gopis, rather than draping them with it, though he came to the rescue of Draupadi. But in Punjab, where the salwar-kameez had its birth, girls are increasingly abandoning it for jeans and top, which they find more convenient to wear. Nowadays, in Kerala only a few old Syrian Christian women wear the traditional chatta (white loose blouse) and white mundu, the un-sexiest dress popularised by the Christian missionaries. The dress will go into oblivion once my mother and her generation pass away. In his autobiographical The Tribal World of Verrier Elwin, the author lamented the fact that one great disservice the missionaries did to the tribals was to compel them to wear white while their natural instinct was to wear colour. While churidar wins in Kerala, it is becoming extinct in its own territory. But then dress has always been changing. The Indian media has had the longest ever honeymoon with a Prime Minister to date. No, not even Rajiv Gandhi, who liked mediamen, had this long a dalliance. Agreed that the media in the giddy eighties saw young Rajiv as the bright beacon, dragging a kicking, screaming, lethargic nation into the new millennium. But then “the gun” happened. Remember the ‘B’ word? It undid everything else. The “hum jeetenge ya loosenge” or “naani yaad dila denge” seemed cute in front of the barrage that the Bofors guns let loose. Prime Minister Manmohan Singh has had it pretty good so far. And yet, according to sources close to him, he feels hurt when the media criticises him. He should know better. We are like this only. Really, Mr Prime Minister, what have we written against you? Nothing. Does anybody talk about your personal life? Everything there is squeaky clean. No hint of a scandal. Why, you even have done the politically right thing of having not one, but three girl children. In fact, you are so politically right, there are moves to ask you to shift a little to the left. You have no ambitious sons or daughters seeking to pick up your political or academic legacy. In fact not many even know what the first family looks like, so guarded are you and your family. Look what happens in the rest of the world. Poor Sarkozy and Putin had to shed their shirts to get something nice written about them in their media. None of us ever asked you for that. Bill Clinton had to lay bare his personal life. We don’t ask you to that. Of course, that it wouldn’t be colourful enough is another story. Think about the past Prime Ministers and what awful treatment they got at the hands of the free media in India. Poor Mrs. Indira Gandhi had to clamp an Emergency. And the messiah of the middle class, V.P.Singh, as he was called, was dragged through the gutter press once Mandal-Kamandal happened. Poor Weepie still can’t muster a decent press coverage. Naramsimha Rao with pout intact never hid the fact that he distrusted the media. Morarjee Desai, Charan Singh, I.K. Gujral, Deve Gowda and Chandrashekar were treated by the media as hiccups in Indian democratic history. Atal Behari Vajpayee, the “right man in the wrong party”, rarely met with the media once he became Prime Minister. He had his favourite editor friends who were granted exclusive meetings. This ensured that hardly any criticism of Vajpayee made it to the pages of the newspapers. Media management reached its zenith under this able administrator. But you don’t even have to do that. Your media managers don’t manage the media because they don’t need to. You get good press simply because your image of being completely incorruptible, totally unambitious and squeaky clean makes you dull copy. It is just that you have to take the fall for your apparent friendship with Mr Bush. Nobody can figure that one out. Amartya Sen being your friend, yes, that is understandable. But Dubya? Why is it that the only pictures of you smiling broadly and actually making voluntary physical contact is when you put your hands on his shoulders in Germany and when he had his hand on your collar in New Delhi? The media in India has yet to come to terms with this bonhomie” between the world’s most highly educated head of government and a man whose academic skills are best left unspoken. You said he was the best friend India could have in the US. Really? I am sure even poor Bush is fascinated with that comment. You see, not many even in America want to be called his friend. But back to the Prime Minister. He should take heart in the knowledge that the media has been treating him with kid gloves. They are just too busy trying to understand the fact that India is actually shining and the government doesn’t even want to take credit for that! Mr Sharif says he can reverse his decision only when the Supreme Court will be restored to its pre-November 3 position, when it had independent-minded Iftikhar Chaudhry as the Chief Justice of Pakistan. “The judiciary wanted the law-enforcers and secret agencies to trace the missing persons, which enraged General Musharraf and he imposed the second martial law in the country,” the PML (N) chief said while presiding over an APDM meeting on Thursday. In his opinion, “Musharraf would do no favour by lifting the emergency. The real issue is the restoration of the judiciary to its pre-November 3 status”, Mr Sharif was quoted by The News as saying. Ms Benazir Bhutto’s PPP and Maulana Fazlur Rehman’s Jamiatul Ulema-e-Islam (JUI), which will participate in the elections, are in no position to weaken President Musharraf’s PML (Q). If the course of politics remains unchanged, the President without his army uniform may have no threat to his position. As a noted security analyst Nasim Zehra says, Musharraf will continue to be “backed by the army”. The belief based on the army’s history that “removing the uniform will weaken Musharraf is not entirely true. They (army commanders) are comfortable with him. He remains their commander-in-chief and the current army commanders are his trusted men. They view him as a protector of national and corporate interests. The army’s support for Musharraf will remain intact until he becomes politically costly” for Pakistan, Zehra points out in an article in The News (Nov 29). Pakistan’s new Chief of Army Staff, Gen Ashfaq Parvez Kayani, who assumed the charge of his office on Thursday, said on the occasion that the professional capabilities of the armed forces would be enhanced, according to Daily Times. But analysts believe he will have to work hard to raise the morale of the Pakistan army which has suffered considerably with former Chief of Army Staff Gen Pervez Musharraf remaining busy with protecting his position as the ruler of his country, with the help of the army. As Dr Naseem Chisti says in an article in The Frontier Post (Nov 30), “The circumstances in which General Kiyani has taken over as Chief of Army Staff, to say the least are, precarious. While Pakistan is facing a war-like situation within its own boundaries in the tribal areas and other parts of the NWFP and Baluchistan, the presence of the Allied Forces in Afghanistan can in no way be said to be a good omen for Islamabad. “Keeping in view the past history of Pakistan, General Kiyani has good chances of rising to the position of the head of state. Even though he decides otherwise, he will still be the most important functionary in Pakistan for the next three years by virtue of his position as the Chief of Army Staff. “General Kiyani belongs to an ordinary family. His father Lehrasap Kiyani retired from the Pakistan Army as Naib Subedar. “He likes to keep a low profile and does not involve himself in unnecessary controversies. This may be evidenced from the fact that, despite being the ISI chief, he stayed neutral during the tussle between President Gen Pervez Musharraf and Chief Justice Iftikhar Muhammad Chaudhry earlier this year which unfortunately resulted in the … unceremonial dismissal of the Chief Justice and over 50 judges of the superior courts”, Dr Chishti adds. Tribal politics in Balochistan is set to take a new turn with the death of a young sardar, Balaach Marri, under suspicious circumstances. Balaah has reportedly been killed in Afghanistan 15 months after the death of Nawab Akbar Khan Bugti. It is believed that the Bugti tribe is behind his death. According to Momin Iftikhar in The News, “Tribal politics in Balochistan has traditionally revolved around three sardars – Nawab Akbar Bugti, Khair Bux Marri and Attaullah Mengal – and their complex relationship has shaped the province’s politics. Balaach’s killing is likely to lead to more bloodshed, adding to the already precarious situation in Balochistan.